Connected hardware devices are at the heart of IoT. IoT devices monitor and instrument “things,” or real-world objects, including industrial equipment, home appliances, buildings, cars, warehouse inventory items, and people (in the case of wearable devices). When you develop new IoT solutions, hardware and software components are designed, prototyped, and refined through an iterative process of feedback and evaluation. Hobbyist hardware platforms like Arduino and Raspberry Pi can help jump start this process of rapid prototyping and refinement, because they are readily available and require less investment than designing and fabricating custom printed circuit boards (PCBs) at each iteration of the design. As part of this process, you’ll need to consider the hardware requirements for your own IoT application, and evaluate and refine the prototype IoT devices that you build against these requirements and adapt them, adopting off-the-shelf components or custom components as appropriate. In the context of IoT, device is an overloaded term that describes hardware that has been designed or adapted for a particular purpose. It is used to refer to individual hardware components including sensors and actuators, as well as to off-the-shelf boards like Raspberry Pi, and also to custom prototype and production units that are built from a number of constituent devices. In this article, I’ll review some of the widely available off-the-shelf hardware options and discuss why you might choose one device over another when prototyping and developing your next IoT project. New devices and device platforms are continually being released as the IoT landscape matures. You need to understand the key characteristics that are common across most IoT devices to compare and evaluate new devices as they become available. Data acquisition (DAQ) is the process of measuring real-world conditions and converting these measurements into digital readings at fixed-time intervals (the data sample rate). DAQ also involves signal conditioning, which is used to manipulate and scale raw sensor readings, and analog-to-digital converters, which are used to convert the analog sensor readings into digital values so that they can be processed and analyzed. Sensors are the input components that measure physical variables and convert them to electrical signals (voltages). You can choose from thousands of types of off-the-shelf sensors to measure a range of variables, including temperature, humidity, pressure, smoke, gas, light, sound, vibration, air-flow, water-flow, speed, acceleration, proximity, GPS position, altitude, or force, and the list goes on. But sensors don’t just measure ambient conditions; proprioceptive sensors monitor the internal state of the device, and sensors like buttons, sliders, or a touchscreen can be used for interacting directly with the device, providing a Human-Machine Interface. For each individual type of sensor, like a temperature sensor, you’ll have dozens of alternative component choices from a range of manufacturers, each with slightly different specifications in terms of accuracy and precision, and each designed for specific applications and operating conditions, such as for use underwater or to withstand extremes of heat and cold. An important characteristic of sensor components is their resolution. The resolution of a sensor represents the smallest amount of change that the sensor can reliably read and is related to the size of the numeric value that is used to represent raw sensor readings. For example, an analog temperature sensor with 10 bits of resolution represents a temperature reading using a numeric value between 0 and 1023. Bits are binary, so 10 bits provides two to the power of 10, or 1024 possible values in total. However, in practice, sensors are affected by electrical noise which reduces the actual resolution. While sensors convert a physical variable like temperature to an electrical signal, output devices are the inverse: they convert an electrical signal to a physical outcome. Output devices include LEDs, speakers and screens, and actuators like motors or solenoids that move or control things in the physical world. Actuators are commonly deployed within industrial IoT applications; for example, pneumatic linear actuators are widely adopted in manufacturing to move and grip products during the assembly process. IoT devices require data processing and storage capabilities to perform basic handling, transformation, and analysis of the data that they capture. IoT devices can process data directly, or they can transmit this data to other devices, gateway devices, or cloud services or apps for aggregation and analysis. Edge analytics involves performing data analysis at the edges of a network rather than in a centralized location. Data can be analyzed in near real-time on the devices themselves, or on a nearby gateway device (like a router) that the IoT devices are immediately connected to, rather than devices transmitting large volumes of data upstream to a cloud server or data center for further analysis. Processing data at the edge provides an opportunity to aggregate and filter the data as it is collected, with only the most salient data selected to be sent upstream. Ultimately, edge analytics reduces the upstream processing and storage requirements as well as relieves the load on the network. The processing power and storage that is used by an IoT application will depend on how much processing occurs on the device itself as opposed to how much processing is performed by the services or apps that consume the data. The amount of memory that is available and the specifications of the processor, including the clock speed and number of cores, determine the rate at which data can be processed by the device. The capacity of the non-volatile flash memory, which is used to persist data until it can be transmitted upstream, determines how much data can be stored on the device. Devices performing edge analytics will require substantially more processing capabilities than devices that perform only basic data processing like validating, normalizing, scaling, or converting readings, such as converting raw temperature readings into Celsius. Network connectivity is one of the defining characteristics of any IoT device. Devices communicate with other devices locally, and publish data to services and apps in the cloud. Some devices communicate wirelessly, by using 802.11 (wifi), Bluetooth, RFID, cellular networks, or Low Power wide area network (LPWAN) technologies like LoRa, SigFox or NB-IoT. Wired communication is suited to stationary devices, which are installed in smart buildings, home automation, and industrial control applications, where they can be connected with Ethernet or retrofitted with Ethernet over power. Serial communication is also a form of wired connectivity between devices, using standard protocols like Universal Asynchronous Receiver Transmitter (UART), or the Controller Area Network (CAN) protocol, which has its origins in the automotive industry. Power management is of particular concern for portable and wearable IoT devices that rely on batteries or other non-wired power sources like solar. Depending on the usage patterns and the power requirements of the attached sensors, actuators, or Integrated Circuits (ICs) that provide data acquisition and control, storage, processing and networking capabilities, a device might need to be put into sleep mode or into low-power mode periodically to conserve power or extend battery life. For example, a single-board computer like the Raspberry Pi 3 requires around 700 – 1000mA of current to operate under typical usage. If you were transmitting data constantly over the wifi network, or if you were placing the device under heavy load by performing a lot of data processing on the device, the power usage would be at the upper end of that scale and would drop whenever the device was idle. If you connect a camera module, the current required increases by around 250mA whenever the camera is in use. 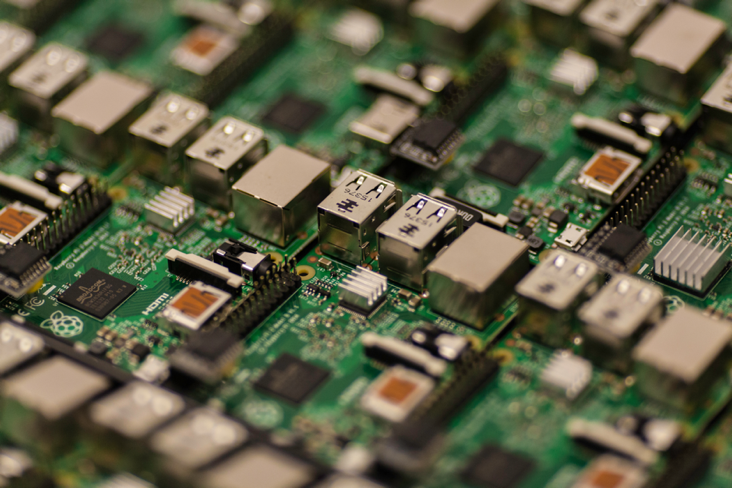 Sensors usually require power to operate, and the GPIO pins on the Raspberry Pi supply 3.3V or 5V, up to a total of 50mA current across all of the pins, so the power consumption of the device as a whole also increases as you increase the number of components that are attached to the pins. Developing IoT applications is more accessible than ever, thanks to the growing range of low-cost, commercially available off-the-shelf hardware development boards, platforms, and prototyping kits. Modular hardware designs provide a great deal of flexibility. You can substitute alternative components and try out sensors with slightly different specifications, or you can independently upgrade the networking, data processing, or storage modules of a device to cater for evolving requirements. Many commercial off-the-shelf hardware devices, including micro controllers and single board computers, are designed around System-on-a-Chip (SoC) ICs. SoCs bundle a number of capabilities including data processing, storage, and networking, onto a single chip. This configuration means that you sacrifice some flexibility for the sake of convenience, but, fortunately, there are a huge number of commodity devices available with a range of configurations to choose from. For example, lists the technical specifications for a selection of microcontrollers that can be used for prototyping IoT projects, while provides a comparison of three popular Single-Board-Computers (SBCs). A microcontroller is a SoC that provides data processing and storage capabilities. Microcontrollers contain a processor core (or cores), memory (RAM), and erasable programmable read-only memory (EPROM) for storing the custom programs that run on the microcontroller. Microcontroller development boards are PCBs with additional circuitry to support the microcontroller to make it more convenient to prototype with and program the chip. Sensors and actuators connect to the microcontroller through digital or analog General Purpose Input/Output (GPIO) pins or through a hardware bus. Standard communication protocols like I2C and SPI are used for intra-device communication with the components that are connected with the bus. Adopting standards makes it easier to add or swap out components that are connected with the bus. 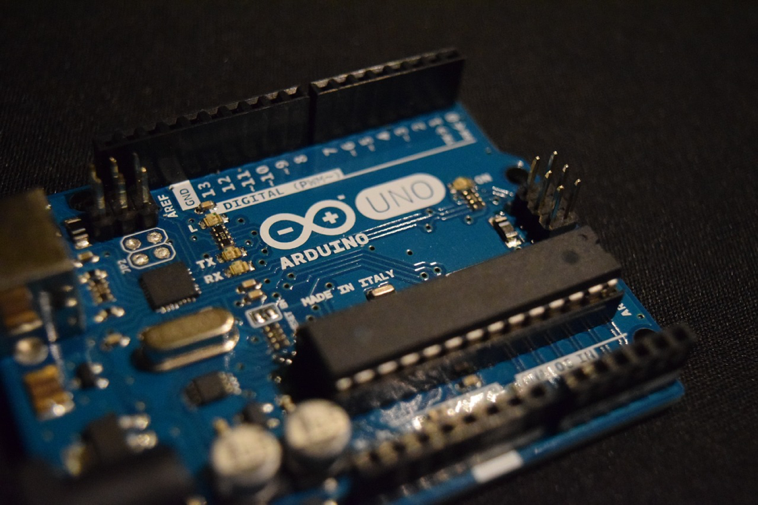 Arduino (http://arduino.cc/en/Main/) is an open source device platform, with an active community who are creating compatible development boards and tooling. Device capabilities vary across the official Arduino models (https://www.arduino.cc/en/Products/Compare)), and also between the dozens of third-party compatible boards. All of the devices in are Arduino-compatible microcontrollers, including the ubiquitous Arduino Uno, Particle’s Electron, which includes an integrated cellular modem, and Espressif Systems’ (https://espressif.com/en/products/hardware/esp8266ex/overview) ESP8266-01, a low cost, low-power microcontroller with integrated wifi. Selecting an Arduino-compatible microcontroller makes it easier to port programs that are developed using the cross-platform Arduino libraries and Arduino IDE to run on other Arduino-compatible devices. You will still have differences to work around, for example, the Arduino Uno uses 5V logic on digital I/O pins (where 0 volts equals LOW or OFF and 5 volts equals HIGH or ON), but the ESP8266 and Particle boards use 3.3V logic (HIGH is 3.3V). This might affect your choice of sensor or actuator components, as some components only work with one or the other. Swapping sensors that are designed for 5V to 3.3V logic might result in unpredictable results and possibly damage the pins that are intolerant to higher voltages, and so you’d need to add a logic-level converter to make this work. When you get down to implementing low-level hardware features like enabling deep sleep mode or reading from connected sensors by using specific protocols, you’ll likely need to rely on device or component-specific libraries that will make your code less portable. Single board computers (SBCs) are a step up from microcontrollers, because they allow you to attach peripheral devices like keyboards, mice, and screens, as well as offering more memory and processing power (for example, a 1.2 GHz 32-bit ARM microprocessor from compared to an 8-bit 16KHz microcontroller from ). lists technical specifications for three SBCs, the Raspberry Pi 3 Model B (https://www.raspberrypi.org/), BeagleBone Black (http://beagleboard.org/black) and DragonBoard 410c (https://developer.qualcomm.com/hardware/dragonboard-410c). The distinction between microcontrollers and single-board-computers is somewhat arbitrary. Some devices, like the Onion Omega 2 (https://docs.onion.io/omega2-docs/omega2.html#omega2), fall somewhere in between, with almost as much on-board memory and processing capability as a low-end SBC. There are also a number of hybrid devices, like the UDOO Quad (http://www.udoo.org/docs/Introduction/Introduction.html) that integrate an ARM-based Linux system with an Arduino-compatible micro-controller. As with microcontrollers, SBC device capabilities can be expanded through the addition of stackable expansion boards known as hats on Raspberry Pi and capes on BeagleBone Black, and through the addition of external modules, such as motor controllers or analog-to-digital converters, to mitigate limitations with the built-in device capabilities. Many SBC devices are more like a mini-PC, and run an embedded operating system, typically a streamlined Linux distribution. As a result, there are many more development tools and language choices that are available for developing embedded applications that work with the attached sensors and actuators on these devices than on microcontroller boards. However, SBCs are more complex to set up, larger, more power hungry, and more prone to problems like corruption of the SD card or flash memory where applications are stored. Although off-the-shelf microcontroller development boards and single-board computers might only get you part of the way towards a fully realized IoT solution, they are great for bootstrapping its development. For example, for setting up a home automation system on a budget, I’d choose the Raspberry Pi Zero W, because it is a small and very low-cost SBC device (around $10), with ample processing power and memory (1GHz ARM6 processor and 512 MB RAM) for performing data processing and analytics on the device. It supports microSD card flash memory expansion up to 64GB for storing programs and data. And, it is equipped with a full 40-pin GPIO header, just like the Raspberry Pi 3, which allows connecting multiple sensors and supports both SPI and I2C protocols. It has on-board wifi for connecting with a home network, and it can be powered with micro-USB off a portable power pack or wall power supply. As you progress further with prototyping your IoT devices and embedded software, as well as the upstream services and apps, you can periodically assess your prototypes against your functional and non-functional requirements including performance, reliability, and security, and revisit these choices as necessary. Security is a critical element within IoT and must be considered at all stages of design and development. The integrity and security of the data that is captured by the device must remain intact, even during prototyping. Security requirements relate to the security of the IoT devices themselves, hardening of the network, and the security of related cloud services and mobile and web applications. While prototyping, ease of development is another high priority requirement so that you can quickly and easily get your IoT device up and running, capturing data, and communicating with other devices and the cloud. Consider the accessibility, availability, and quality of API documentation, development tools, and support offered by the hardware manufacturer or by the development community. Select devices that are quick and easy to program and re-flash, as well as being low touch to deploy, with zero or minimal per-device configuration required, to cut down on frustration and save time while you are developing your IoT solution. The number of sensors that are connected, the resolution of the data that is captured, and the rate at which the data is sampled all determine the volume of data to be processed, which impacts on data processing and storage requirements. The amount of data that needs to be retained on a device is dependent on how frequently the device connects to transmit data upstream. A wired, always-connected device that is installed in a smart building, one that streams low volumes of raw data directly to a highly available server, will require less data processing power and storage compared to a device that needs to process large volumes of data in bursts. A device that only connects every few hours to conserve power will require more storage to log data locally in the interim. Connectivity requirements for wireless networking include operating range, or how far the signal will need to be transmitted, as well as the anticipated volume and rate of data to be transmitted. Consider fault-tolerance and the ability for a device to reconnect and retry sending data after it was disconnected. Your hardware might have integrated network connectivity like Bluetooth or wifi, or this capability might need to be added with an expansion board or module. An external module that can be upgraded can provide more flexibility, as you have the option to try different modules to evaluate their range and power consumption. Many of the other requirements, including the number of sensors that you need and the rate of network transmission, will have an impact on the device’s power requirements. Consider whether your device will be wired, or whether it will require a portable power source like a battery or supercapacitor. If it requires a battery, you need to know the size, weight, and capacity requirements for the battery, as well as whether the battry should be rechargeable, replaceable, or whether the device should be discarded after the battery dies. If the device is rechargeable, how often should be charged, and by what means? The physical device design requirements include the appearance and size of the device. The environmental conditions in which the device will be installed also need to be considered, for example, will it need a waterproof or ruggedized enclosure? For example, a device that is installed on the underside of a truck as part of a fleet monitoring application would need to be shielded to ensure it continued to operate under harsh conditions; it would need to be waterproof and resistant to dirt, shock, and vibration. The cost of the hardware includes the initial outlay for the hardware and associated components (such as any sensors) as well as their on-going operating costs, such as power and maintenance costs in the form of replacing worn parts or defective components. You might also need to pay ongoing licensing fees for some components or device drivers. Purchasing a handful of commercially available off-the-shelf development boards or SBCs might be more affordable than producing tiny runs of custom boards in the early stages of development; however, as you begin to scale up into dozens or hundreds of devices, dedicated hardware devices might become a better value proposition. There is no one-size-fits all approach to selecting hardware for IoT projects. Adopting standards-based, commodity hardware like microcontrollers or single-board-computers can save time and expense in the early stages of development, without sacrificing flexibility. What you learn in the prototyping phase can help you use critical hardware design decisions when you move into deploying your IoT solution.